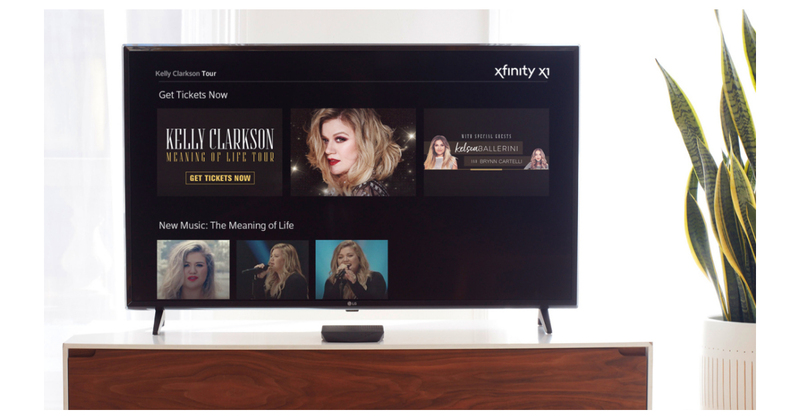 PHILADELPHIA–(BUSINESS WIRE)–Comcast and Ticketmaster today announced an industry-first integration that enables Xfinity X1 customers to find tour dates and request concert tickets for their favorite performers directly on the television through Ticketmaster’s open ticketing platform. This integration launches with three-time Grammy winner Kelly Clarkson and her 2019 “Meaning of Life” tour. Beginning today, X1 customers can simply say “Kelly Clarkson Tour” into their Voice Remote to take advantage of a special presale window and see a list of Clarkson’s local performance dates and venues right on the TV. From September 18-23, all Xfinity customers can enjoy access to a special presale window and also purchase their tickets via xfinity.com. Ticketmaster and X1 will continue to provide localized ticket information throughout the general admission sale starting September 24. *Xfinity presale begins 10 a.m. local time. Kelly Clarkson, who earlier this year released her critically acclaimed eighth studio album, “Meaning of Life,” is among the most popular artists of this era with total worldwide sales of more than 25 million albums and 36 million singles. The Texas-born, Nashville-based singer-songwriter first came to fame in 2002 as the winner of the inaugural season of “American Idol.” Clarkson’s debut single, “A Moment Like This,” followed and quickly went to #1 on Billboard’s Hot 100, ultimately ranking as the year’s best-selling single in the U.S. Further, Clarkson is, without doubt, one of pop’s top singles artists, with 17 singles boasting multi-platinum, platinum and gold certifications around the world, including such global favorites as “Miss Independent” and “Because of You.” Clarkson has received a vast array of awards and nominations, among them three Grammy Awards, and was the first artist to top each of Billboard’s pop, adult contemporary, country and dance charts.